Today’s also our very first Odin’s Day of the Ragnarol campaign, also called Wednesday by the English. While Thor might be the most famous god of the Viking pantheon, it’s his daddy Odin that will be hearing battle prayers in Ragnaroll, and that gives his name to the most middle of the week days. Thor was loved by the working man perhaps because, unlike his father, he favoured strength and honesty over guile, and his iconic hammer was symbolic of this, a tool of labour, not of war. Odin, on the other hand, was a god for those who did not sow, and delighted in the wars and battles of men. Odin was a god of kings, jarls and heroes; a god for the bad times ahead; a god for hump day! So every Odin’s Day we’re going to feature one of the heroes of Ragnaroll. 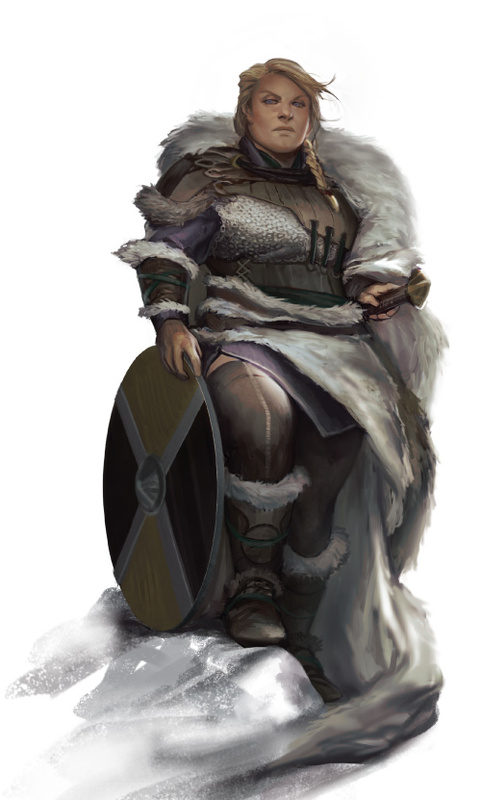 First up is Hilda Shieldmother, the fierce lady you see in our main image. Nobody weak survived this far into the long winter of Ragnaroll. When everything else was falling down, when brother turned against brother, and banditry was rife, Hilda stayed strong and held her ground. There were other heroes in her clan, men who called themselves leaders, but their ambitions were often bigger than their raiding parties, and it wasn’t long before the people of the clan looked to Hilda as a voice of reason. But nobody makes it through the long winter innocent, there were some hard choices to make in those dark times. Hilda’s not a maiden anymore, she’s one mean mother. Gain 1 glory for each of your Vikings that is lost or slain. Gain 2 glory when Hilda successfully defends. Reroll all of your Vikings with a Snakes result. Your opponent must use axes to slay as many Vikings as possible before using axes to take stores. No Vikings are lost or wounded in this battle. If Hilda is slain defending your hall, gain 2 additional glory. If Hilda is the only one of your Vikings slain in a battle, gain 2 additional glory When Hilda dies, flip this mat to the revenge side. Hilda’s Death condition also provides some interesting options and a nice chunk of glory, making her revenge inevitable (and perhaps sudden) if you can have her sacrifice herself in defence of her hall. So what do you think of Hilda Shieldmother? Perhaps she’s a little too pragmatic for those of you who have their ambitions set on carving a name for yourself with some epic raiding. Well, next week, you’ll meet another lovely lady of the apocalypse. They call her Freya the Red and that’s got nothing to do with the colour of her hair.